Today's Prompt: Sharing. Comment! Pick someone else’s blog post and write a comment to them. Write that comment as your post for today and link back to them to let them know you were inspired. This isn't sharing. It's venting. But the person I care about and want to respond to does not have a blog. 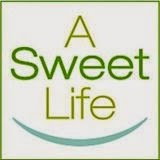 I have a person in my life with a different form of diabetes than I have. 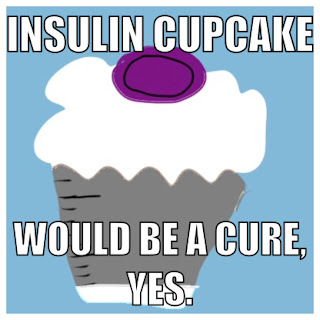 Call it prediabetes, glucose intolerance, type 2, whatever. It's different. I'll grant that. It is not, however, as different as she thinks it is. And I'm constantly frustrated. I can't seem to help her the way I want to or make what I feel would be a positive impact. And if I can't help those closest to me, how can I call myself an advocate? Anyway, if eating candy is being used as a way to drop the glucose level, what's actually happening is that it is overworking that last handful of remaining beta cells and causing insulin overproduction in this person, leading them further down the path toward needing insulin replacement. Chocolate is a treat, not a treatment. Granola bars with 19g of carb are not protein sources, even if they have a few grams of protein. They're starchy snacks. Turkey is a protein source. Yogurt is a protein source. A grain is not. And protein will not lower your glucose level. 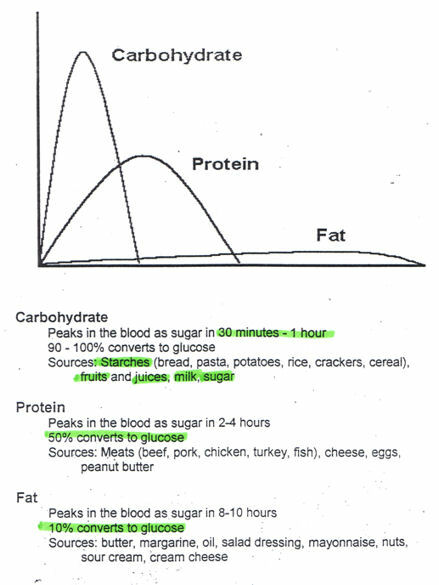 Protein converts to glucose as well. Blood sugar may be volatile, but it is not magical. All our bodies work pretty similarly. (Unless you're that guy I learned about in high school biology class whose stomach ferments rice into rice wine. Or that poor lady whose hair follicles produce fingernails.) You're unique, sure, but you are human. 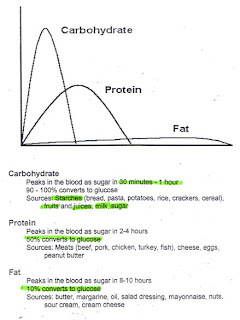 Food you eat converts to glucose, high glycemic carbs more quickly than low, all carbs more quickly than protein, protein more quickly than fat. Glucose requires insulin to regulate how your cells process it. Your body makes the amount it makes and, if it doesn't make enough (or any at all, like mine), you have to take it via some kind of injection or infusion. If your body still produces insulin but seems to be losing its regulatory abilities, there are dozens of "anti-diabetic" drugs that nudge it along. Maybe you've been prescribed acarbose, which slows the post-meal spike. Maybe Metformin which keeps you from absorbing so much glucose from food and makes you more sensitive to insulin. Maybe you've been asked to live a more active lifestyle and eat a healthier diet - which would also make you absorb less glucose, have fewer spikes, and make you more sensitive to the insulin you produce. All of these treatment strategies are for one goal - controlling how your body responds to food so that your glucose level does not rise above the level it would in a non-diabetic body. So that it does not rise above 140 mg/dL. What raises blood glucose? Almost everything. Food - all of it, even protein. Stress. Illness. Hormones. Steroids. The act of even thinking about eating a bowl of cereal. What lowers it? Only two things, really. Medications designed to do so and physical activity. That's it. There is nothing you can eat to lower your blood glucose. Great post. My dad and a few of my aunts/uncles have Type 2 diabetes and it's really hard to watch them do certain things thinking it's "ok" because they have Type 2. I understand the frustration of feeling like an advocate and then watching your dad order and eat a root beer float (not diet, either). We have two relatives who are simply *enchanted* with my son's diabetes. It's like they want to be part of it, or think it makes them nicer (because he is so nice, or because they think it's glam to be a victim & they see him as a victim? ): "My doctor said I have pre-diabetes." Then mournful "we've got it rough" facial expression. Then eats half a loaf of bread. I love this post because I can so relate to it. Be it type 2, gestational diabetes, pre-diabetes, whatever, each comes with its own set of challenges, and each person's blood glucose level reacts a little bit differently to food, insulin, and exercise. But we ALL react. 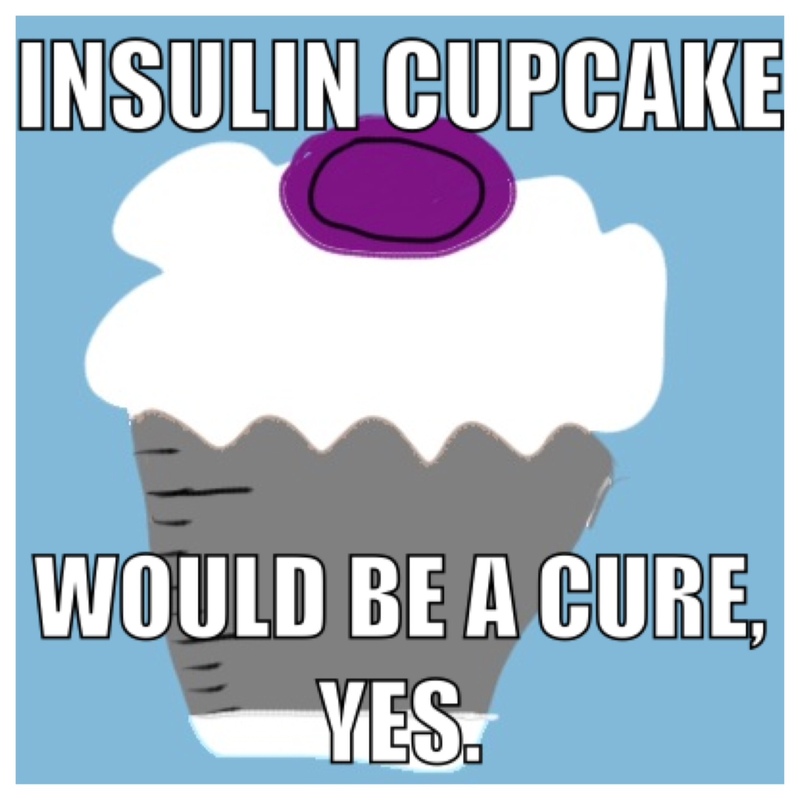 Just because someone is not dependent on multiple daily insulin injections, does not mean they are any less susceptible to the blood sugar spike after eating the granola bar or ice cream sundae or whatever other high carb, high glycemic index food they are ingesting. And while advice or feedback from a non-doctor, or non-type 1 may be well intended, until someone has "walked a mile" in type 1 shoes, so to speak, I don't think they really get it. I don't think they CAN get it, no more how good their intentions.